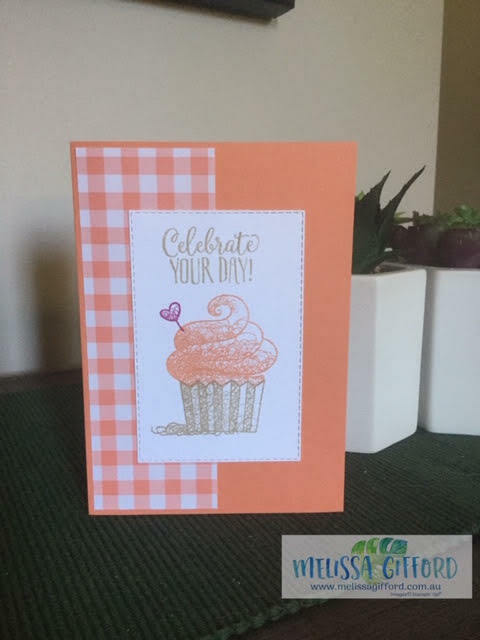 Melissa Gifford - Independent Stampin' Up!® Demonstrator: Celebrate your day with a cupcake! Celebrate your day with a cupcake! Doesn't this cupcake look delicious? Almost good enough to eat! This cutie is from a stamp set called Hello Cupcake - another FREE set you can earn with a $90 order. This set is photopolymer which makes lining up the layers of the cake so easy. And there are several other sentiments and elements to customise your cake just how you like it. For this card I used crumb cake and grapefruit grove - which are rather appropriate names don't you think? !